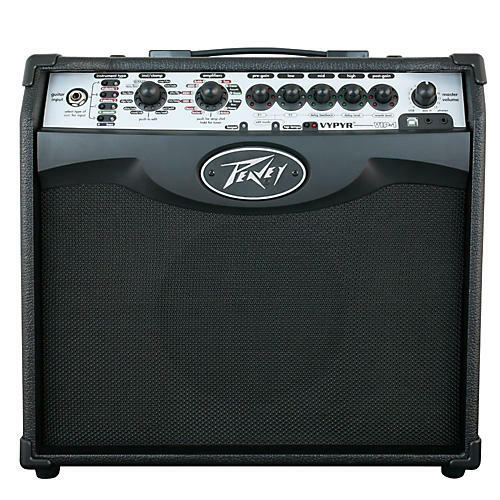 A 20W combo with bass, acoustic and electric guitar models. The Peavey VYPYR VIP 1 guitar modeling combo amp provides amplification for a variety of instruments using Variable Instrument Performance technology. Peavey uses a combination of powerful 32-bit, floating point SHARC processors and patented TransTube analog circuitry to create some of the best sounding modeling amps available. All VYPYR effects, amp models and parameter controls can be accessed without plugging into a computer, unlike many other modeling amps. The USB bi-directional data and audio port provides an easy way to record, connect to VYPYR software, store presets, get lessons and practice to backing tracks. All the features from the original VYPYR series is here, plus more power, effects, amp models, instrument models and other added goodies! Call or click to pick up this combo that morphs from a bass amp, to an electric amp, to an acoustic amp.